This thematic issue of Molecular Diagnosis and Therapy focuses on novel therapeutic approaches and diagnostic strategies for the management of genetic diseases, including rare genetic diseases. These two issues are strictly associated when patient stratification and personalized therapy in precision medicine are to be applied. For this reason, the term ‘theranostics’ has been proposed—combining ‘therapeutic strategies’ and ‘diagnostics’ within the same term. Four articles in this issue review therapeutic approaches, discussing the issue of gene therapy , gene editing [2, 3], and microRNA (miRNA) therapeutics . Ghiaccio et al. review gene therapy for β-thalassemia with respect to the milestones reached, novel developments, and present (and future) challenges. This is a very important issue, as gene therapy for β-thalassemia is currently undergoing validation in several clinical trials [5, 6, 7, 8]. Encouraging results have recently been presented on transfusion-dependent β-thalassemia patients in trials based on different therapeutic vectors carrying a therapeutic β-globin gene. The phase III clinical trials underway at present are expected to help determine benefit/risk/cost ratios to move gene therapy toward clinical practice . The relatively new approach based on gene editing is the object of two review articles by Lederer and Kleanthous [2, 3]. CRISPR (clustered regularly interspaced short palindromic repeats)/Cas9-based tools and therapy development for rare genetic diseases is indeed a fascinating possibility for site-specific correction of the genetic mutations causing hereditary pathologies, as also summarized in other review articles available in the recent literature [9, 10, 11, 12, 13]. Growing interest appears to be associated with novel markers and molecular targets, which might lead to implementation of the therapeutic protocols in pre-clinical studies. In this respect, the network constituted by transcription factors and non-coding RNAs (ncRNAs; including miRNAs) might be of great interest in the regulation of gene expression in genetic diseases, as described by Finotti et al. . In fact, since their discovery and classification, the roles of ncRNAs have gained great attention in genetic diseases, and both miRNAs and long ncRNAs (lncRNAs) can be considered excellent markers for advanced diagnostic protocols and suitable targets for therapeutic interventions [14, 15, 16, 17]. The obvious conclusion of these review articles is that they indicate miRNA-targeting transcription factors as novel targets (miRNA therapeutics). In this respect, both anti-miRNA molecules or miRNA mimicking strategies might be of interest . The review by Finotti et al. points to the regulation of the γ-globin transcriptional repressor as a possible key element to be modified to obtain clinically relevant outcomes in β-thalassemia and other hemoglobinopathies. This article should be considered together with the papers by Katsantoni  (Omics as a tool for identification of novel biomarkers associated to β-thalassemia) and Menzel and Thein  (describing gene modifiers in sickle-cell disease). The Omics approach requires in-depth analyses, including genomics, epigenomics, transcriptomics, proteomics, and metabolomics. The review by Katsantoni  discusses how novel gene variants/sequences, transcripts, ncRNAs, proteins, and metabolites involved in the pathogenesis of β-thalassemia are expected to be identified in the near future through Omics methodologies. One selected example is that reported by Menzel and Thein , in which several polymorphisms involve miRNA-regulated transcription factors (such as MYB and BCL11A) [20, 21]. An example of the importance of targeting other pathophysiological features (in addition to those related to the primary genetic mutation) is presented by Fibach and Dana , who describe the consequences of oxidative stress in β-thalassemia . Finally, further examples supporting studies aimed at patient stratification and personalized therapy in precision medicine are discussed in the case of cystic fibrosis  and Shwachman-Diamond syndrome . 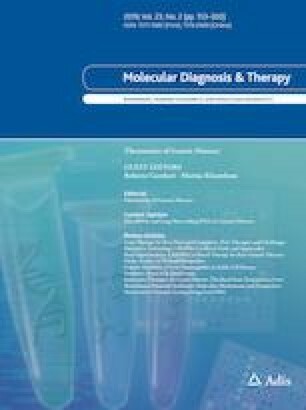 As already mentioned, the identification of the molecular mechanisms underlying the genetic diseases of interest might allow the definition of the parameters to be investigated in diagnostics, including the very important issue of non-invasive prenatal diagnosis, as presented by Breveglieri et al. .
Several studies presented in this thematic issue of Molecular Diagnosis and Therapy [1, 2, 3, 18, 19, 22, 23, 24, 25] were partially supported by the EU FP6 ITHANET Project (eInfrastructure for THAlassaemia research NETwork)  and by the EU FP7 THALAMOSS Project (THALAssaemia MOdular Stratification System for personalized therapy of beta-thalassemia). Roberto Gambari and Marina Kleanthous have no conflicts of interest to report. Roberto Gambari and Marina Kleanthous report no funding relating to this editorial.